It's been a while since my last Wedding Wednesday post, but that's because I've been so busy wedding planning! I'm going to a bridal fair and dress shopping this weekend, so I promise the next post won't be so delayed. Today I'm so excited to share the story behind my favorite piece of jewelry! Even though I've been engaged a little over 5 months I still find myself getting distracted by this shiny ring on my finger. If you'd asked me to describe my perfect engagement ring I would have described something totally different, but now I can't picture anything else on my finger. I always pictured myself with either a pear or marquise shape diamond and a simple band, and I have a Pinterest board full of those rings to prove it. 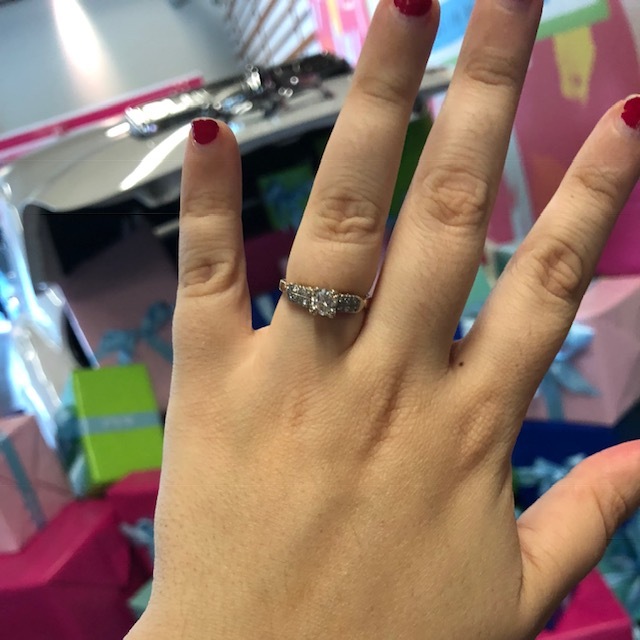 Before I got engaged I'd joke that my biggest fear was to one day discover my engagement ring was the same as every other mom in the car pool line; that is something I 100% do not have to worry about now! My ring is actually an antique, originally belonging to my fiancé's grandmother. My future MIL graciously allowed it to become mine when I mentioned how much I love family rings. Whatever ring my fiancé gave me would obviously be special, but the fact it belonged to his grandmother makes it that much better. He doesn't really remember his grandmother because she died when he was little, but the fact his mom let me have something so precious to her is really touching. They always say when you get married you're marrying the entire family. I'm so fortunate to have amazing future in-laws who have loved and welcomed me from the start. Having this beautiful antique ring on my finger reminds me how lucky I am to have found someone who I love with a family I love as much as my own. Beautiful! I love this so much.